Research by Martijn Cremers and Antti Petajisto of Yale Management School, recently endorsed by Morningstar, finds a strong link between "active share" – the extent to which a fund’s holdings differ from its benchmark’s - and performance. Unlike the information ratio, which simply measures performance per unit of volatility, Cremers and Petajisto’s research looks at what is inside portfolios, then finds robust links between portfolios’ profiles and future performance. 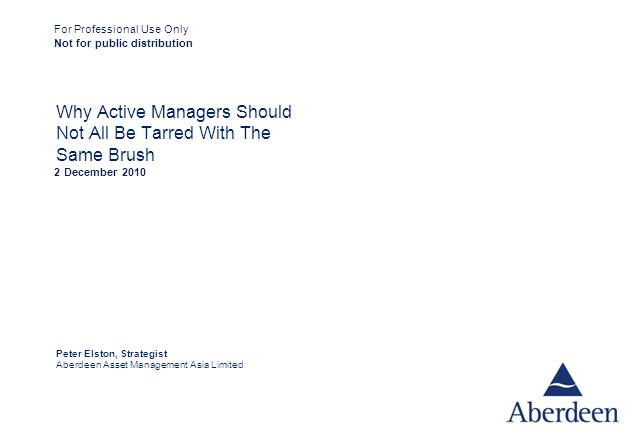 We explore the role of the diversified stock picker and explain why the active versus passive debate is the wrong discussion. Passive is a valuable tool but so is smart active. The closed-end structure lends itself well to smart active and we’ll explain why.